Published September 24, 2014 By Leisa Good This post may contain affiliate links. Regardless, I only recommend sites I've researched and/or used and trust. Do you enjoy working as a virtual assistant? Are you tired of marketing for private clients? Would you like a company that would just find you the clients? Then Worldwide101 might be the right work-at-home (WAH) job for you. 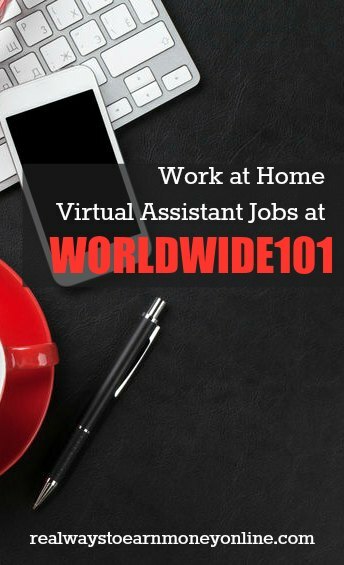 Worldwide101 is a work-at-home company that offers multi-lingual support from virtual assistants who are carefully matched to their clients based on skills and personality. This is opposed to the virtual assistant finding her own clients. You may work part-time or full-time in the comfort of your home. Worldwide101 is similar to Belay Solutions, Time Etc., and many other virtual assistant companies which have already been reviewed on this blog or elsewhere. I would not compare Worldwide101 to a company like Fancy Hands, because while it offers virtual assisting, the pay at Fancy Hands is allocated by completing short tasks for the indicated amount as opposed to an hourly or project wage. Virtual assistants who don’t have a lot of money or time for marketing tend to enjoy working at Worldwide101. The clients are basically found for them as opposed to having to spend large segments of time or money to market for them. Also, when a client leaves, there is no scrambling to find a replacement client. WorldWide101 will do it for you. Anyone who has ever done virtual assistance knows that this is a constant challenge, especially since some clients can also be temporary or short-term. The clients at Worldwide101 are long-term. They do not offer short, project-based work. The pay will be commensurate with your experience. It appears that pay is $18 to $20 USD an hour. While it is not completely clear, it appears the pay is once a month via PayPal. What Are the Computer Requirements at Worldwide101? The computer requirements are fairly standard at Worldwide101. As long as you have an updated laptop or PC with updated virus and malware protection, you are fine. It can be a PC or a Mac, and they do allow some work to be done via iPhone or iPad. What Types of Work Will You Be Doing as a Virtual Assistant for Worldwide101? In general, VA's offer many different services. What you end up doing for clients will depend on your specific skillset. experienced with at least 7 years of administrative, executive, or corporate experience. fluent speakers and writers of the English language, especially business English. multi-taskers and can prioritize work. knowledgeable of online tools and software. quick learners when it comes to technology. At Real Ways to Earn, we realize not everyone is going to meet this extensive list of requirements. And because of this, we've put together a list of virtual assistant jobs for beginners – companies that will likely give you a chance even if you are inexperienced. Does Worldwide101 Hire Virtual Assistants From Other Countries? As of now, Worldwide101 only accepts applicants living in the US, Canada, and Europe. At Worldwide101 you are an independent contractor and responsible for your own taxes. Most independent contractors only work part-time at Worldwide101. Should you make over $600 a year, Worldwide101 would send you a 1099 Income Tax Form. What Are the Hours at Worldwide101? The maximum amount you can work (according to their own website) is 25 hours per week. However, reviews on Glassdoor.com indicate that some of their virtual assistants do have full-time hours. It is fairly flexible because they work to assign you with clients whose hours would match your availability. You must agree to work at minimum 20 hours per week. What Do Workers Think Of Worldwide101? It seems to have an overall good and sound reputation for what I was able to uncover. You can check for their reviews at Glassdoor and see that they have a five star rating from many satisfied workers. How Can an Interested Applicant Apply to Worldwide101? Go to this page and get started with the application. Be prepared to upload a resume and a picture of your home office. Should WorldWide101 be interested in you, you will do two video interviews and psychometric testing. You also must supply them with references and submit to background checks. @Nicole – Now! Now! Be encouraged! There are other places to apply as well. Have you tried Time Etc. or Red Butler or Zirtual? I applied and I have not heard from them. Boo! 🙁 Thanks for the thorough review. I would like to apply but they require a pic of your office and I don’t have an office. @ Jennifer – never meant to offend anyone. Just trying to be grammatically correct, which now states that for singular verb and noun agreement use “her”. Back in the day it was his/her or “his”, now the latest Chicago Tribute editing guidelines dictate “her” to can be used to keep the ever repetitive his/her from continuing. Tell your husband congratulations and keep up the good work. I’d love to see more men sign on! I think you should change the word “her” to “their” because it could be offending to your male followers of this site. Men can be virtual assistants too, right? My husband has been one for a year now.